Hurricane Katrina was one of the greatest natural disasters in the history of the United States. The Women of the Storm, an organization formed by the women of New Orleans gathered the following statistics. 80% of New Orleans flooded, that's an area equal in size to SEVEN Manhattan Islands. 1,500 people died; 134 were still missing two years after the storm. 204,000-plus homes severely damaged. Over 800,000-plus citizens were forced to live outside of their homes, the greatest diaspora since the Dust Bowl of the 30's. Tens of thousands New Orleanians still reside outside of Louisiana. 81,688 FEMA trailers were originally occupied, many of which are shown to have unsafe levels of formaldehyde toxicity. 1.2 million families received Red Cross assistance. 33,544 persons were rescued by Coast Guard. 34 years worth of trash and debris was spread around New Orleans alone. There were 900,000 insurance claims at a cost of $22.6 billion. New Orleans flooded mainly because the ill-constructed levees broke. In June 2006, Lieutenant General Carl Strock of the Army Corps of Engineers, accepted responsibility on behalf of the Army Corps Engineers for the failure of the flood protection in New Orleans, calling it "a system in name only." He also said the report showed that "we missed something in the design." The loss of the natural wetlands that formerly protected us from flood surge was also a contributing factor in our devastation. That fact was worsened by the Mississippi River Gulf Outlet (MR GO) built by the oil companies through the wetlands for their interests. MR GO funneled the rising storm surge directly into St. Bernard Parish and Eastern New Orleans. Since Hurricane Katrina, many levees have been reconstructed, Mr. Go has been closed, and our fight to save our wetlands has finally been noticed around the country. For more information about the Louisiana Wetlands and our fight to preserve them go to the America's Wetlands Foundation's website. 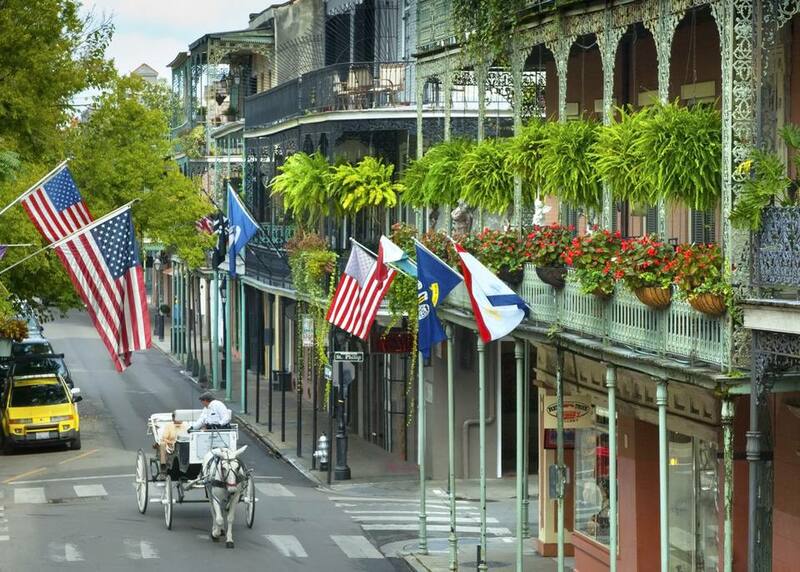 The French Quarter, which most tourists associate with New Orleans, was not structurally damaged by Katrina. The old city took care of itself, and the Quarter looks pretty much as it has for years. Jackson Square is still beautiful and inviting, surrounded by artists painting, fortune tellers seeing the future, mimes, musicians, and dancers. It is alive with spirit. The restaurants, hotels, and clubs are vibrant and welcoming, as always. It is almost impossible to be disappointed if you are a returning visitor, for you know what to expect--charm, music, food, and fun. The St. Charles Streetcar has been up and running for some time now, and the beauty of the Avenue is nearly intact. Try taking a tour of the city on a streetcar, or a walking tour of the Garden District, still the most informative as well as a pleasant way of seeing this part of the American Sector. Most tours start at Lafayette Cemetery across the street from venerable Commander's Palace. Uptown is full of great restaurants and even the venerable Camellia Grill has re-opened, causing great joy among the locals. The Warehouse District, with its museums, art galleries, and entertainment, is much as it ever was--less bohemian than the Quarter, not as decorous as Uptown, and always a lot of fun. New places are opening, and old places are thriving. The convention business is flourishing, and those in the industry have been more than up to it--according to conventioneers polled, they have excelled at providing any and all services necessary to conduct business and offer fun along the way. You may still see a few shuttered storefronts in some areas of town. It's true--small businesses suffered after the hurricane due to insurance issues, personnel problems, and other financial concerns. While many smaller businesses have struggled, lots more are blooming. A number of new stores have opened on Magazine Street, to join your old favorites, making it the most successful retail area in town. You can still buy your high-end antiques and stylish clothing in the Quarter as well. The port has been reopened for a long time, and cruise ships regularly sail from the river near Woldenberg Park. There are more restaurants open now than before Katrina. New Music venues have opened. Bourbon Street appears to be returning to its jazz roots--Irvin Mayfield has a club, The Jazz Playhouse, in the Royal Sonesta. Frenchmen Street, made famous by the HBO series "Treme" is open and filled with patrons. Is New Orleans Still Depressed? The Lakeview area and the Ninth Ward, not usually on the tourist route, are coming back vigorously. The Lakeview area is filled with determined residents who have worked hard to reopen schools and businesses, and many have returned to their homes. Many have also relocated to the Lakeview area, as there have been opportunities to obtain great homes at bargain prices. The lower Ninth Ward has returned thanks to Brad Pitt and his Make it Right Foundation, which built new, green affordable home in this area. Some mansions have sprung up where ruins used to languish. While there is a long way to go, these neighborhoods are being renewed daily. The East is coming back, still slowly to be sure, as more residents return and are able to rebuild. Is it Safe to Visit New Orleans? Despite the determination of the media to portray the city as dangerous, the truth is, you are no more nor less safe here than you are in any major metropolitan area. The real fact is that efforts to reduce crime in New Orleans are showing results, and crime has been decreasing for years. In every city, there are parts of town you need to stay away from, and the same is, unfortunately, true here. Tourists have always been advised not to go into the cemeteries except with tours (with the exception of St. Louis Number 3 and Lafayette Cemetery.) Central City is not the best place to be, but frankly, the tourist or visitor is not likely to need or want to go there. Common sense is the rule in New Orleans, just like anywhere else. If you are a sports fan, there is much to keep you happy. The Saints' contract has been renewed through 2025. The Superdome has undergone a major renovation, to the tune of $80 million dollars. The New Orleans Centre Shopping Mall that was across the street from the dome was destroyed in Hurricane Katrina. It has been removed and a new sports venue "Champions Square" has taken its place. The parties before the Saints home games are now much better than ever. With college football, it's always about the Sugar Bowl, and more recently, the New Orleans Bowl. The Hornets came back in 2007, and the team is thriving here. In a short time, the fan base has mushroomed into a favorite for fans all around the area. Baseball fans enjoy the Zephyrs, a triple A farm team for the Florida Marlins. The Zephyrs always have a good record and they play in a wonderful stadium.